No more risking injury to yourself or others with this Two Wheel Big Tire Dolly for those larger loads. Let it do the heavy transporting for you. 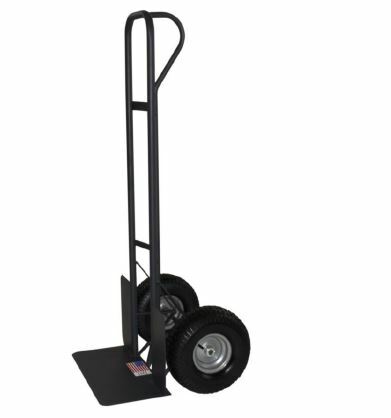 Use the Boss Hoss hand truck to carry a wide variety of loads with ease. The second larger footplate folds up when not needed for large loads to improve maneuverability. Wheel protectors help to cradle wider loads, so they do not wobble during transport. This is a versatile, smooth running sack truck with a heavy-duty, fully welded tubular steel frame. The pneumatic tyred steel tires with ball bearing hubs allow for easier transport on stairs or over bumpy terrain. Pneumatics and wheel guards: 15"
Toe Plate Dimensions: 12" x 24"